Streamsong is in Polk County, FL. It’s not all that far (55 miles) from Orlando, but is closer to Tampa (45 miles). The nearest towns are Lakeland, Fort Meade, Avon Park and Sebring. For the directionally challenged (like me), signage in those communities, is extremely limited and the markers that are available are small. Residents we talked to in those communities weren’t exactly sure how to get there – even though Streamsong is a big-time place. In fact, Streamsong is the name of the town it’s in. and the resort is spread over 1,600 acres. 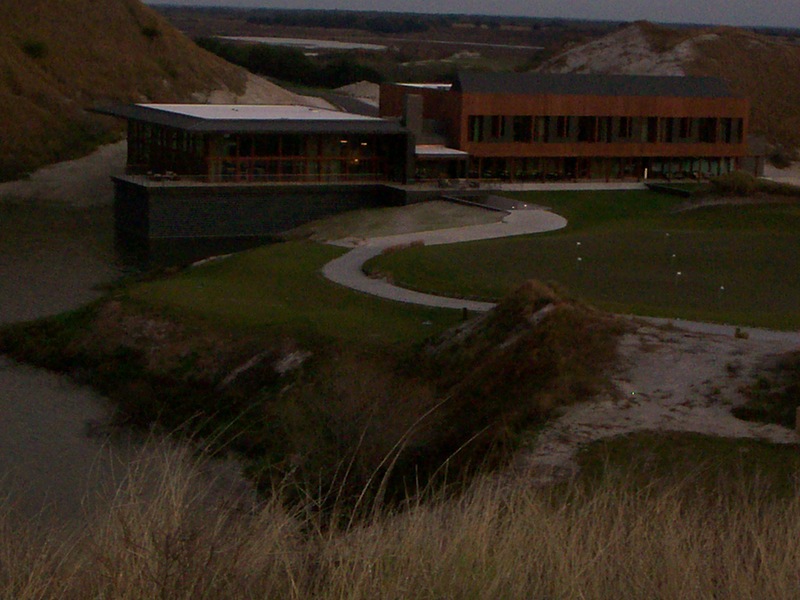 By late afternoon, nine days after Streamsong had a soft opening that attracted about 40 players, I was there. My arrival was well ahead of the scheduled grand opening on Jan. 26. I found a very spacious clubhouse (pictured above) in full operation along with two quality golf courses ready to play and director of golf Scott Wilson in charge of the operation. A few people can already stay there. There’s 16 beds available, but they’re booked solid through May of 2013. Accommodations with the Terrace Hotel in Lakeland provide lodging options now, and the 216-room main lodge is scheduled to open on the property in November. The upscale restaurant offered a striking panoramic view of the courses. Those two courses are, and will remain, the main attraction. The Red course was designed by Bill Coore and Ben Crenshaw and the Blue by Tom Doak. Just the mention of those architects is an indication that visiting Streamsong won’t come cheap, but it figures to be worth whatever the price. The Coore-Crenshaw layout was cited by Golf Magazine as the “Best New U.S. Course You Can Play’’ in 2012 – before it was officially open. The Doak 18 received honorable mention. Wilson is no stranger to such acclaim. He came from the Kemper-operated Vellano Country Club in Chino Hills, Calif. It was Golf Magazine’s Development of the Year (Private Clubs) in 2007. Crenshaw, Coore and Doak did their work on land that had been a phosphate mine. There wasn’t time for me to play either course, but that’s be on my agenda for the near future. I can report that the courses have sweeping elevation changes and an atmosphere far removed from the Florida terrain that surrounds it. 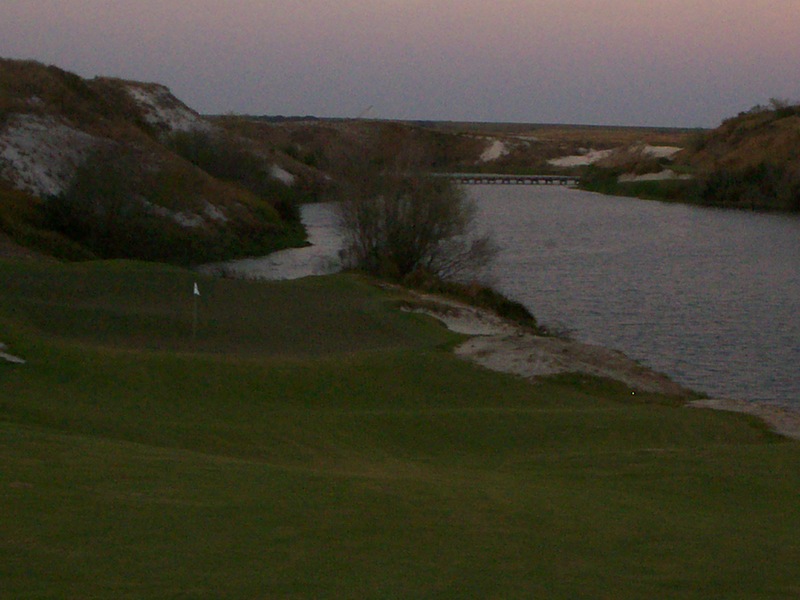 There’s even a par-3 bonus hole (pictured above) to entice Streamsong players. The Coore-Crenshaw course can play as long as 7,148 yards or as short as 5,184. The Doak course is 5,531 yards from the most forward tees and 7,176 from the tips. Both are par-72s. Walking is encouraged, but not mandatory, on both layouts are caddies are available. Eight months after our visit Streamsong — both of its courses — received some extraordinary recognition. Golf Magazine listed both the Red and Blue layouts among its Top 100 Courses in the United States. Red was No. 52 and Blue No. 62 — the top two new courses on the prestigious list.